Research requires data, but finding data can be a laborious process. A new initiative by the Harvey L. Neiman Health Policy Institute aims to make that process a little easier. The project, called the Neiman Almanac, officially went online on March 24. The almanac, located at www.neimanhpi.org/almanac/, had been in the works since August 2012, shortly after the Neiman Institute was launched. Danny R. Hughes, PhD, the research director and a senior research fellow at the Neiman Institute, says the lag time was mainly due to figuring out what sorts of data belong in the Almanac. The people who worked on the project had to determine which data elements would be of the greatest value to users and whether they could be acquired. The Almanac aggregates data from multiple sources, such as the American Hospital Association, the Centers for Medicare & Medicaid Services' Physician/Supplier Procedure Summary Master File, and the Health Resources and Service Administration's Area Health Resources Files, to name a few. All of the data are third-party data, and the oldest sources date to 2003. Users can define search parameters to match their needs and view it in visual displays of both state and national figures, which are accessed through an interactive Web-based interface. There are currently more than 100 different data series available. One goal of the Almanac is to provide data that busy radiologists and policy makers can use to inform their work. 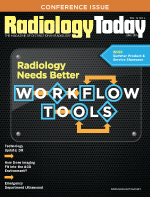 "We want to provide tools that allow practicing radiologists, policy makers, and researchers to have ready access to the data on imaging," Hughes says. "There are a lot of data sources out there but, typically, if you want to know something specific, like how many radiologists there are this year or how many CT scans were ordered in a particular year, it usually involves acquiring one of these databases, hiring a statistician, and actually conducting a study to learn that one item." Hughes says the idea for the Almanac began as a solution to address the many queries the ACR received about various items that radiologists needed, for reasons such as benchmarking, negotiations within their practice, or research. Over time, it became clear that there was a significant need for publically available data that delineate broad utilization, access, and expenditure trends. The Neiman Institute has been working with external academic researchers and radiologists since its inception in 2012, but the response to the Almanac has been immediate. Other than their home page, it's the most popular page on the Neiman Institute's website. Hughes says it accounts for 48% of Web traffic and 12% of users are finding it through search engines, 21% are finding it on social media, and 33% have been directed from other websites. "This is a much more direct, much more powerful way to reach radiologists, to reach out to the policy and radiology community, and it provides them with a tool they can use because, very often someone's first impulse isn't to call the Harvey Neiman Health Policy Institute. Their first impulse is to go to Google and type in something like 'ultrasound volumes,' for example," Hughes says. "But it doesn't take them long before they find our website, find the Neiman Almanac, and really have a chance to interact with the data and understand the breadth of what we have. And, if those high-level, aggregate statistics are sufficient, then they're very happy and they have the data that they need very quickly. If not, we encourage them to contact us directly." The most popular data elements thus far have been related to spending on imaging services, in general and by modality, over time. Users can also find data on utilization, in terms of the absolute number of procedures and by place of service. Since the Almanac went online, Hughes says several people have reached out to the Neiman Institute with ideas for collaborative research projects, which is another goal behind the Almanac. Approximately 30% of the Neiman Institute's research portfolio is dedicated to collaborative projects with external researchers. Unlike traditional networking methods, the Almanac allows users to directly access the data and reach out to Neiman researchers. Hughes says it has already been directly responsible for some of the collaborative research projects that the Neiman Institute has undertaken. Most of the Almanac-generated projects are in the very early stages, but a few of them are in the review stage of the peer-review process. "We really want to make this level of data available for everyone so that they can make much more informed policy decisions and we hope to seed ideas, particularly for young researchers, who are often thinking, 'What data do I have available? How can I really answer these questions?'" Hughes says.